This has proved to be one of the most popular posts from this blog, so it is repeated here on the 151st anniversary of the second day of the Battle of Gettysburg. In honour of the 150th Anniversary of the Battle of Gettysburg, a story of an ordinary woman thrown into extraordinary circumstances and how she rose to the occasion: Elizabeth Thorn, known today as The Angel of Gettysburg. A Woman’s Courage at Gettysburg. Mrs Daffodil’s Aide-memoire: It is interesting, yet disheartening to see that these are the anecdotes most often told about Mrs Thorn, 20 years after the close of the American Civil War. The story of her pointing out the local roads appears in multiple publications during the 1880s, yet the General, whom she guided, only mentions her “refreshments.” Let us look more closely at Mrs Thorn’s extraordinary story. 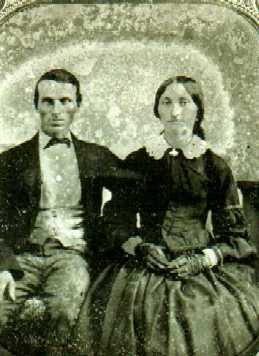 Elizabeth Thorn and her husband, Peter, as well as her parents, lived in the gatehouse to the Evergreen Cemetery at Gettysburg. Her husband enlisted as a soldier, leaving her with three small children—ages 7, 5, and 2. She was six months pregnant when she volunteered to show General Howard the Gettysburg roads. Her obituaries say merely that she witnessed the Battle of Gettysburg. Occasionally they mention that she assisted the General, or that she was Superintendent of the Cemetery in her husband’s absence. The papers are silent on her condition. They did not report how she did her duty in the aftermath of the battle. Working almost entirely without help, in the heat and storms of that July, among the rotting corpses of men and horses, she dug graves in the rocky soil and buried over one hundred soldiers. Near midnight [this would be on the second day of the battle, July 2], when everything was quiet, my father and I undertook to walk home to the Cemetery house. As we left the [neighbor’s] house we had to pass through a room where the Union soldiers were sleeping, lying in two rows, with only one candle to light the whole room. About the middle of one row a man raised himself on his elbow and motioned me to come to him, my father signaled I should go to him, and he took a picture out of his pocket and on it was three little boys, and he said they were his, and they were just little boys like mine, and would I please let him have my little boys sleep near him, and could he have the little one close to him, and the others near him? And so, he took them and had them lying by him…. The next day Mrs Thorn and her family fled to the country, going to a farmhouse where the wounded were being treated. She wrote of seeing the amputated limbs tossed into a corn crib and removed by the wagonload. We were down the country four days and the fifth we went home. On the way home we met Mr. McConaughy. He was the president of the Cemetery at that time and he said to me: “Hurry on home, there is more work for you than you are able to do.” So we hurried on home. When we looked at the house I could only say “O my!” There were [sic] no window glass in the whole house. Some of the frames were knocked out and the pump was broken. Fifteen soldiers were buried beside the pump shed. I went to the cellar to look for the good things I had put there on the first night. One chest was packed with good German linen, others packed with other good things. Everything was gone, but three featherbeds and they were full of blood and mud. After I had dragged them out of the cellar I asked an officer who was riding by, if I would ever get any pay for things spoiled like this. He asked me what it was, and I told him bed clothes that were in the cellar, and he said in a very short way: “No!” So as soon as the pump was fixed I sent for three women and we washed for four days before we got them clean. In the battle, nearly everything the family owned had been destroyed or stolen. For her efforts, Elizabeth Thorn received no extra money beyond her husband’s salary of a little over $12.00 per month and she and her father were criticized as unpatriotic for daring to ask for compensation for their substantial losses. President Lincoln delivered the Gettysburg Address from a platform in Evergreen Cemetery on 19 November, 1863. One wonders if Mrs Thorn, her new daughter in her arms, heard the President speak? Peter Thorn survived the war and returned to the cemetery. He and Elizabeth died within months of each other in 1907 and are buried at Evergreen. You may see more photographs of the statue of this intrepid woman here. The sculptor hid a Civil War relic—a minie ball—in the base of the image. This entry was posted in Death, Grim and Grewsome, News and Announcements, Professions, Victorian and tagged Angel of Gettysburg, Civil War, Civil War casualties, Civil War women, Elizabeth Thorn, Evergreen Cemetery, gravedigging, women at Gettysburg on July 2, 2014 by chriswoodyard. In the battle, nearly everything the family owned had been destroyed or stolen. For her efforts, Elizabeth Thorn received no extra money beyond her husband’s salary of a little over $12.00 per month and she and her father were criticised as unpatriotic for daring to ask for compensation for their substantial losses. President Lincoln delivered the Gettysburg Address from a platform in Evergreen Cemetery on 19 November, 1863. One wonders if Mrs Thorn, her new daughter in her arms, heard the President speak? Peter Thorn survived the war and returned to the cemetery. He and Elizabeth died within months of each other in 1907 and are buried at Evergreen. This entry was posted in Death, Grim and Grewsome, Mourning, News and Announcements, Professions, Victorian and tagged Angel of Gettysburg, Battle of Gettysburg, cemetery, Civil War women, Elizabeth Thorn, Evergreen Cemetery, gravedigging, woman gravedigger, women at Gettysburg on July 3, 2013 by chriswoodyard.